If you are embarrassed about your smile because of decay or dark fillings, you might be the perfect candidate for composite resin tooth colored fillings to take the place of the old silver amalgams. 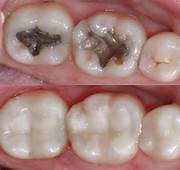 Besides being aesthetically pleasing, composite fillings require less tooth structure to be removed. We believe in conservative dentistry—the more natural tooth structure you keep, the better teeth you have in the future.